If I told you that I could help you SECURE MORE INTERVIEWS, apply for jobs MORE EFFECTIVELY, and most of all LAND YOUR DREAM JOB – how much would your life change? You CAN succeed in this challenging job market! 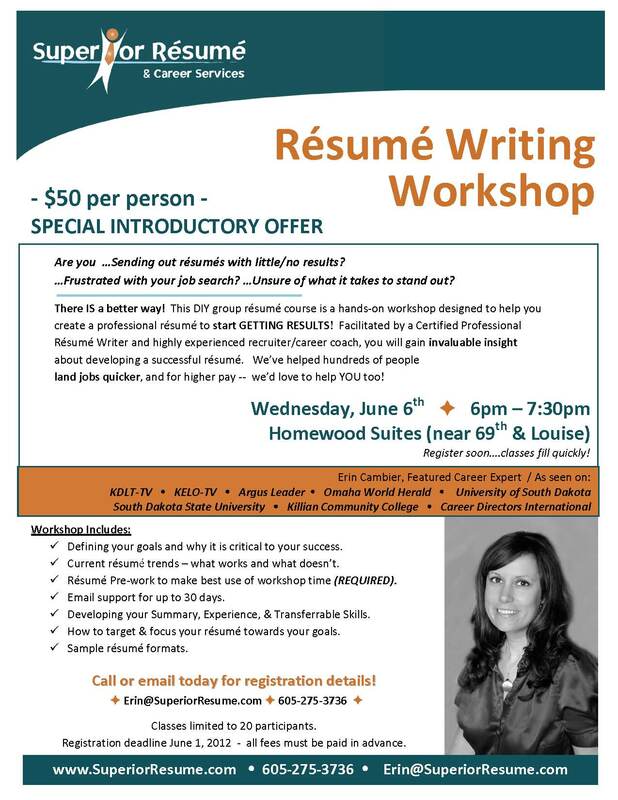 This do-it-yourself group résumé course is a hands-on workshop designed to help you create a professional résumé to start GETTING RESULTS! 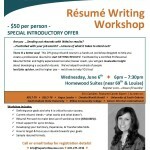 You will gain invaluable insight about developing your own successful résumé and you will leave this workshop with actionable results in significantly improving your résumé and overall job search success. Clients who have incorporated the strategies I share have consistently increased their number of interviews and job offers! Defining your goals and why it is critical to your success. Current résumé trends – what works and what doesn’t. Résumé Pre-work to make best use of workshop time (REQUIRED). Email support for up to 30 days. Developing your Summary, Experience, & Transferable Skills. How to target & focus your résumé towards your goals. You MUST Pre-register for this event by June 1, 2012. Just email me at Erin@SuperiorResume.com or give me a call at 605-275-3736 to register for this course. There are only 20 spots available and classes fill quickly – so please register soon! Click on the flyer to view full details. If your organization or school has a vested interest in your student’s and member’s success in the job search process, you’ve come the right place! I offer large and small group training sessions designed to help job-seekers find long-term career success. Universities, Colleges & Educational Facilities that want to give their graduates an advantage over the competition in the job search. Companies undergoing major layoffs and who are seeking a positive, smooth transition for their team. Associations, Clubs and Groups that desire to aide their members in the job search process, interviewing, and/or transitioning careers. How to REALLY get the job! Training topics can be customized to your groups needs, both in content and in timeline. To learn more, contact Erin today Erin@superiorresume.com. Ready to land more interivews? Enter your details below and we'll send you 5 SIMPLE & POWERFUL RESUME UPDATE STEPS that you can use to update your resume like a rockstar today. I would love to speak with you about your goals and help you speed up your job search. Call me directly at 605.275.3736. For fastest response,schedule a consult on the contact form at the bottom of this page. achieve ALL your career goals! "I got the job! What more can I say? Erin proved to be a great coach, mentor, and excellent at crafting my experience into the search. I landed three interviews, and a job offer." "My job search went amazingly well. I got an offer within 4 days thanks to our work together. I’m currently in Denver and loving life! Couldn’t have done it without you." © Copyright 2010, Superior Resume & Career Services. All rights reserved.